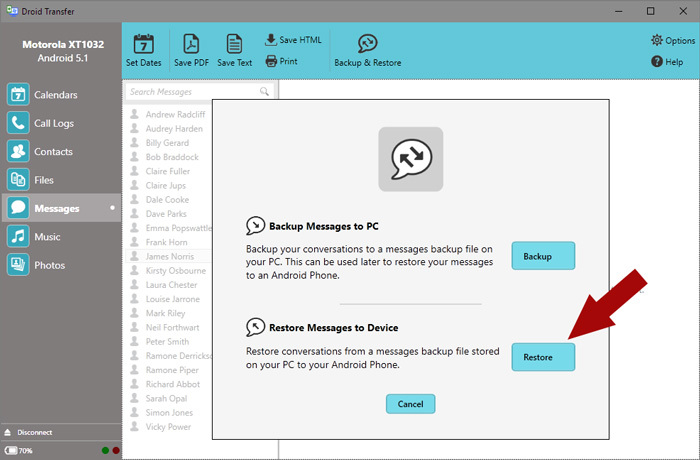 In our previous support article, we explained the importance of creating regular backups of your phone, and a guide on how to create a backup of your messages. This article will take you step-by-step through how to restore a backup to your phone, or transfer your messages to a new phone. Accidentally deleted a message or conversation? Do you have a new phone which you would like to transfer your messages to? Droid Transfer can help with all of the above, and more! Create a backup of your messages using Droid Transfer. Click 'Backup & Restore', then 'Restore'. Select your backup file on your computer, click 'Open'. On your phone, tap 'Make Default' on the pop-up (this is only temporary). Then click 'OK / Yes' to confirm. On your computer, select conversations to restore to your device, and click 'Restore'. On your phone, tap 'OK / Yes' to set your messaging app back to default. Next, select your backup file from your PC and click 'Open'. Now we need to do a little housekeeping on your Android Phone. A pop-up will appear asking if you would like to make Transfer Companion your default messaging app. This is necessary in order for Droid Transfer to restore messages to your device, but is only a temporary change. The default app will be reverted to the original one after the message restore is complete. This change will not affect your phone's ability to receive messages. On the pop-up tap 'Make Default', then 'OK / Yes' to confirm. Back to Droid Transfer on your PC: select the conversations you wish to restore to your Android Device, then click 'Restore'. 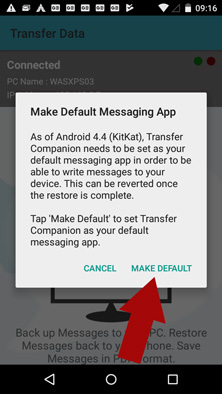 Once the restore is complete, as promised, Transfer Companion on your phone will prompt you to revert your default messaging app. Just tap 'OK / Yes' to complete this process. If you have a new Android device, and you would like to transfer your old device's message to it, Droid Transfer can do this too! 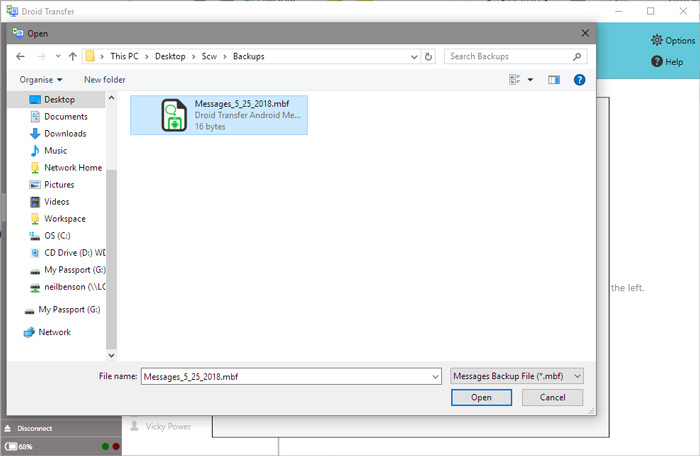 Simply create a backup of your old device's messages to your PC using Droid Transfer. Then, download Transfer Companion on your new Android device, connect it to Droid Transfer on your PC, and complete the restore process in this article. Your new device will be populated with your old device's messages! When you restore messages and message conversations to a device, you don't have to worry about duplicating data. 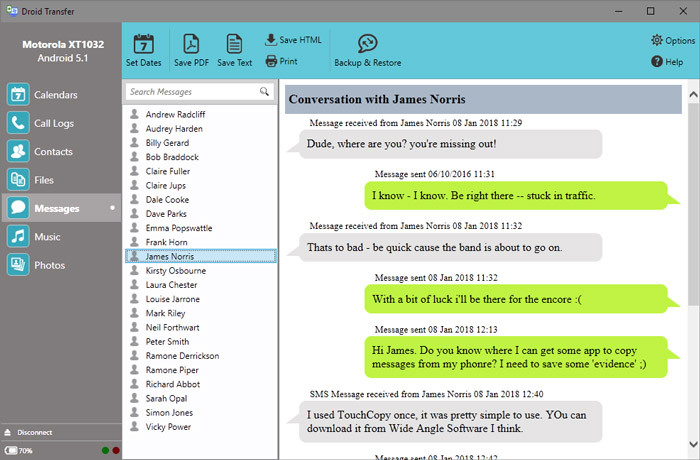 Droid Transfer makes sure that only the gaps are filled in, and if a message or conversation exists already, it will not be duplicated. Also, when restoring a message conversation from a contact which does not yet exist on the device you are restoring to, Droid Transfer will intelligently add the contact to your contacts.